The 2018 FIFA World Cup took place this summer in Russia, and it lasted about a month. The group stage games took place from June 14th all the way to June 28th, and the major shocker was how Germany didn’t advance to the Round of 16 or the knockout rounds. Germany won the cup in 2014, and the only other year in which they didn’t reach the quarter-finals was in 1938. The Round of 16, which occurred from June 30th through July 3rd, was an exciting round filled with some major upsets. On the first day of the knockout round, Argentina and Portugal lost to France and Uruguay, which meant that Messi and Ronaldo were both eliminated. One of the biggest surprises, however, was that the next day Spain, a favorite to win it all, lost to Russia in penalties. The teams that reached the quarter-finals were France, who played Uruguay; Belgium, who played Brazil; England, who played Sweden; and Croatia, who played Russia. Another upset occurred in the World Cup as Brazil was stunned by Belgium 2-1. The semi-finals matchups were France vs Belgium and England vs Croatia. The first game was on July 10th, and it was the France-Belgium game. 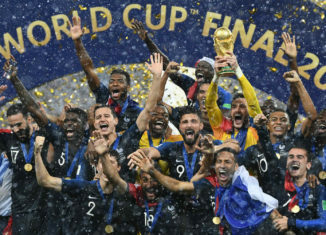 The lone goal was scored by the French Defenseman Samuel Umtiti in the 51st minute to advance France to the World Cup Final. On July 11th, England played Croatia, and it was very exciting, back and forth game. The action started right away, as Kieran Trippier scored in the 5th minute for England to put them ahead early 1-0. They carried that lead into halftime and even for a while into the second half, until Croatia’s Ivan Perisic scored in the 68th minute to tie it. The game went into extra time tied at 1 apiece. In the 109th minute, Mario Mandzukic scored what would turn out to be the game-winner, and it sent them to the title game. The World Cup Final between France and Croatia was very competitive in the beginning, but not so much towards the end of the match. In the 18th minute, Mandzukic scored an own goal for France, and then 10 minutes later, Perisic scored for Croatia to tie it at 1. Then, 10 minutes after that goal, Antoine Griezmann scored for France, and they took a 2-1 lead into halftime. In the second half, teammates Paul Pogba and Kylian Mbappe both scored for France 6 minutes apart, and although Croatia scored another goal, France hung on to win their second ever World Cup, by a score of 4-2. France’s first championship was in 1998, where it was played in their home country. The next World Cup, scheduled for 2022, will be hosted by Qatar, and they will become the first Arab state to host the World Cup. The tournament will take place in late fall to early winter, instead of during the summer. France will go for back-to-back championships, but as everyone learned from Germany this year, it will be very tough. Can Heading A Soccer Ball Be More Dangerous for Women Than Men?